How do you know that's a non-breeding Dunlin? Is he missing important breeding equipment? Obviously all Dunlins are not the non-breeding variety. Do they look different? Breeding plumage changes range from non-existent to flamboyant. Raptors and birds of prey don't change at all but many birds look totally different as they get ready for the all-important breeding season. Many birds have brightly colored feathers to attract mates and to distinguish between juveniles and adults. The Dunlins spend their Winter along our coast and start the plumage transition late in our Spring. The photo on the left (taken by Bill Maroldo) shows the russet cap, back and dark belly characteristic of breeding colors. It was taken last May at Brazoria National Wildlife Refuge. They migrate to the Arctic Tundra (AKA Canada) to breed in the Summer. Breeding plumage is a huge subject, so let's just talk about Brown Pelicans today. Everyone is familiar with the giant comical guys hanging around the shore. Starting with a juvenile Brown Pelican. He, or she as there is no noticeable sexual dimorphism in Brown Pelicans, is light brownish-gray with a lighter chest. Legs and feet are also gray brown and they all seem to have an innocent, goofy look to me. Note that his eyes are dark brown. Still a handsome bird, but clearly a juvenile so an adult won't waste their time with courtship behaviors. Young pelicans take 3-5 years to reach sexual maturity. Once they get grown, the body feathers are an iridescent gray and they now sport a white throat and neck, and a nice yellow head. Note that his eye is now pale blue. The pouch area is a gun metal gray although the color varies a bit and looks paler when stretched out or full of fish. The bill is pale. This bird might still be too young to breed or hasn't transitioned to breeding plumage yet. Or it isn't breeding season. They nearly disappeared from North America between the late 1950s and early 1970s because of pesticides entering the food chain. The pesticide endrin killed pelicans outright, while DDT contamination led to thin-shelled eggs that broke under the weight of the parents. The above greedy adult is transitioning to/from breeding plumage brown feathers along the back of his neck. He is also trying to swallow a giant fish. Some of the Texas Brown Pelicans get bright red pouches during breeding season as shown in the one above who just swallowed a little fish. The protrusion at the bottom of the pouch is not the fish, but part of his anatomy. And...this is where the story gets murky. There are two races of Brown Pelicans, an Atlantic race (which the Texas Brown Pelicans belong to) and a Pacific race. The Pacific race gets the bright red pouch during breeding season and our Atlantic variety does not. 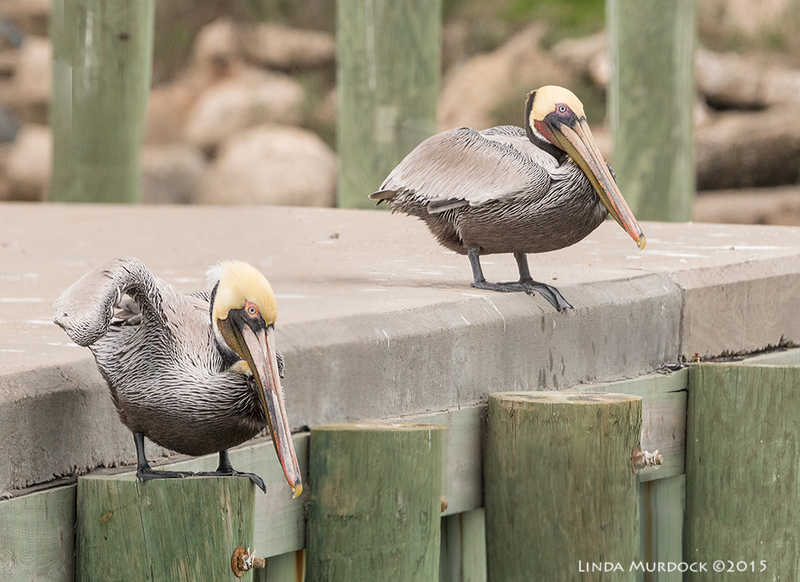 Yet, perhaps 10-15% of the Brown Pelicans along the Texas coast have the red pouch coloration. The above photo was taken at Surfside, Texas on Jan 11, 2016. He was with a small group of several adults and at least one juvenile scooping up small fish in a big pond. And he was the only one with a red pouch and other characteristic breeding plumage. We see Brown Pelicans with red pouches often along the coast in late Winter/early Spring; in fact we actively search for them. It was difficult to find two together in my archives, but there was at least one in the group at the fish cleaning table last February at Texas City Dike. The above photo is a composite since I photographed each bird separately, but I have all the RAW files. The internet and bird ID forums have plenty of discussions about why we keep seeing the Pacific variety along the Texas coast. There are two theories about the Texas presence of red-pouched Atlantic race Brown Pelicans: When the Texas Gulf Coast population was decimated by DDT in the 1970s, Pacific race Brown Pelicans were imported to bolster the declining populations. Records do not seem to support this theory, but it still is possible. Or, natural progression of the Pacific race across Central America and then up the Gulf coast of Mexico and to Texas has introduced the red coloration. I am inclined to agree with my friends Elisa Lewis and Chris Cunningham (who wrote about this last year on their excellent blog) that it is probably bit of both. It appears the two populations will interbreed given close geographical proximity, but we only have anecdotal observations for that. The banding programs and some nesting reports (more breeding pairs show up than the years before while accounting for birth rates) do suggest fluidity in the bird populations. DNA studies could hopefully resolve some of the controversy, but the current state of the data does illustrate the pitfalls and confusion about "breeding plumage" at least in classifying Brown Pelicans by appearance alone. Periodically (and often in response to DNA studies) the ornithological world gets shook up with new groupings and names. A few years ago it was over Ridgeway/Clapper Rails; before that there was the Common Gallinule/Moorhen change. Well, did that help explain anything? Do you get excited about minute classifications? Do you think it would be easier if humans displayed some kind of clues as to their breeding intentions? Let me know your thoughts in the comments below.